Since a “cessation in hostilities” in Syria's multi-sided civil war was declared on February 27, about 6000 people have been killed in the conflict. This “cessation in hostilities” was brokered by the International Syria Support Group (ISSG), made up of the United Nations, the European Union and the Arab League and the governments of Britain, China, Egypt, France, Germany, Iran, Iraq, Italy, Jordan, Lebanon, Oman, Qatar, Russia, Saudi Arabia, Turkey, United Arab Emirates and the United States. The ISSG is co-chaired by the US and Russia. The US government has admitted to killing 20 civilians in Iraq and Syria over five months, a death toll far below that estimated by independent observers. Washington had previously acknowledged 26 civilian casualties. In a statement released on April 22, the US Central Command insisted that the killing of the civilians, and the injuring of 11 others, was legal. Since the Mu'l'livaaykkaal killings of 2009, the Tamil diaspora has mostly focused political efforts towards demanding justice for the inhuman crimes committed against Tamil civilians. While such efforts have elevated international awareness of the gross human rights violations committed by the Sri Lankan military during the war, the approach has not yielded results on prosecuting the perpetrators of the international crimes. Below is the speech given by Socialist Alliance member Dave Holmes to a Melbourne meeting and concert to mark the founding of the Kurdistan Workers Party (PKK). About 400-500 people attended the November 28 event organised by the Kurdish Association of Victoria at the Kurdish House centre in Melbourne’s Pascoe Vale. British parliament sat late into the night on December 2 before eventually voting up Prime Minister David Cameron's proposal to join the US-led air war in Syria. Opposition Labour Party leader and veteran anti-war activist Jeremy Corbyn argued strongly against bombing Syria, as did protesters outside parliament. However, many right-wing Labour MPs supported the government. 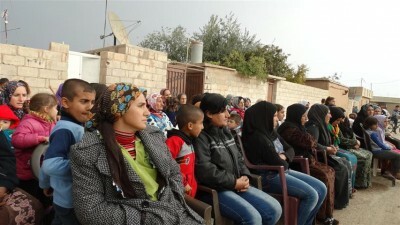 A meeting in Rojava's capital, Qamislo, of the Assyrian ethnic minority. Photo from www.robertgraham.wordpress.com. The West's terror hypocrisy: who is the biggest threat? Since the terrorist attacks in Paris on November 13, the world's leaders and media have predictably reminding the world that the attacks' perpetrator – ISIS – has declared war to the death against humanity. ISIS would not deny this. Indeed, making this point was the reason it carried out the Paris attacks, which killed 129 people.